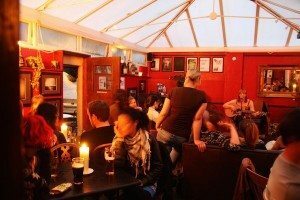 The Lord Nelson on Trafalgar Street is one of Brighton’s traditional old intimate friendly boozers. It hasn’t changed very much in appearance since my dad used to drink in there in the 60’s when he lived on Tidy Street just around the corner. It looks tiny from outside, but when you walk through it’s like a big magical Harry Potter-esque tardis, which opens up into a huge covered conservatory at the back, with cobbled floor and Victorian feature fireplaces. The atmosphere when I went this week with my mum was friendly and understated, a good mix of people and a good mix of music made for a really comfortable evening. ..the menu is very reasonably priced and everything created upstairs by the tall chef. 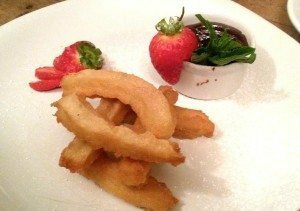 It’s real home cooked style food, with some good old favourites which won’t break the bank, – plus the menu changes daily depending on what’s in season and what produce is available from their local suppliers. We chose Crispy Devilled Whitebait with homemade Tartar Sauce and Bubble and Squeak Cake with Soft Free Range Poached Egg for starters to share. The portion sizes were very generous and coming in at £4.50 and £5.00 were really reasonable. Which was why we ordered two – we thought at that price they must be a normal starter size. 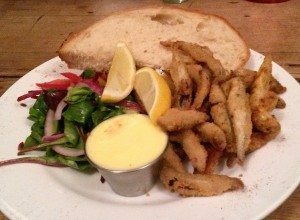 The Whitebait had a very light and crunchy crumb coating, they were moist and tasty and perfectly well seasoned and really delicious. The salad garnish was shaved beetroot and cucumber with peppers and red onion, all lightly and delicately dressed. The homemade tartar sauce was amazing, crunchy and thick and perfect dipping fodder for the whitebait. A brilliant starter and one I would definitely like to repeat. The Bubble and Squeak Cake also was generous in proportion, and really very tasty. 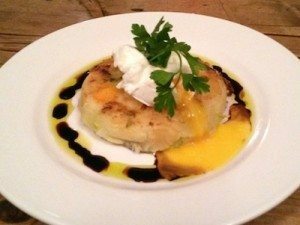 It was soft and homely and warming and wintery, with its runny poached egg and finished with a drizzle of balsamic vinegar. The creamy potato and cabbage with nutmeg was a dream partnership. For mains, which were by now unnecessary but obviously we ate them anyway (natch), were just as good. 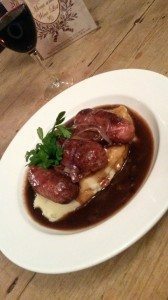 Mum ordered Sussex Sausages with Creamy Mash and Caramelised Onion Gravy, which were amazing. The mash was smooth, creamy and delicious, the sausages firm, peppery and meaty, and the onion gravy quite spectacular. I opted for the Beef Stroganoff which had a creamy field mushroom and brandy sauce, served with wild rice. It was smooth and nicely seasoned with succulent strips of quality steak, perfectly cooked with peppers, mushrooms and red onion. It was so obviously freshly cooked and the peppers were sweet and crunchy and went amazingly well with the nice nutty rice. Both mains were under £8, and we got a lot of food for our money. The lovely lady serving us talked us into the ‘home-made-that-morning’ White Chocolate and Raspberry Cheesecake, which was intoxicatingly good. 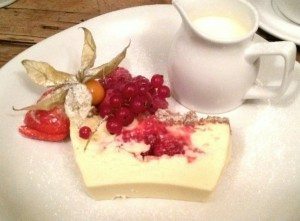 Smooth, creamy and not overly sweet – on a crunchy biscuit base served with a heap of glistening red berries. As it seemed like a bit of a contest now (a stupid contest of purest greed) we also shared the Nelson’s Mexican Churros. In for a penny, in for a massively indulgent evening. I’m not normally a lover of churros, but I was talked into them and boy was I glad I had been… Yes, is the answer. They were chewy and crisp, sprinkled with delicate cinnamon sugar with strawberries and mint on the side. The chocolate sauce was IN CRED A BULL (!) thick, dark, bitter and mesmerizingly good. Unfortunately for us though, we had just eaten our weight in this glorious meal so couldn’t finish either of them off. I would advise that when you come (and come you must!) please don’t eat all day. It’s really worth it. The food is great, fresh and very reasonably priced, the service impeccable and the atmosphere warm. What more could you want on a rainy evening? Not much. Make a Booking on 01273 695872 – it would be great if you mention Restaurants Brighton when you do!